This is a Cooking Light recipe and to my dismay, it was called White Bean and Sausage Ragout with Tomatoes, Kale and Zucchini. One of the reasons, I have difficulty titling recipes is because of a trend of listing all the main ingredients, in the title. I am guilty of doing this, as well, but I don't really like it. I understand, by naming all the ingredients, it is apt to have something that appeals to almost everyone. On the other hand, who wants to read an ingredient list, as the title of the recipe? The problem is, what gets cut out? In this recipe, everything is important. There is no star. Each food works with the others and the result is in the total dish. 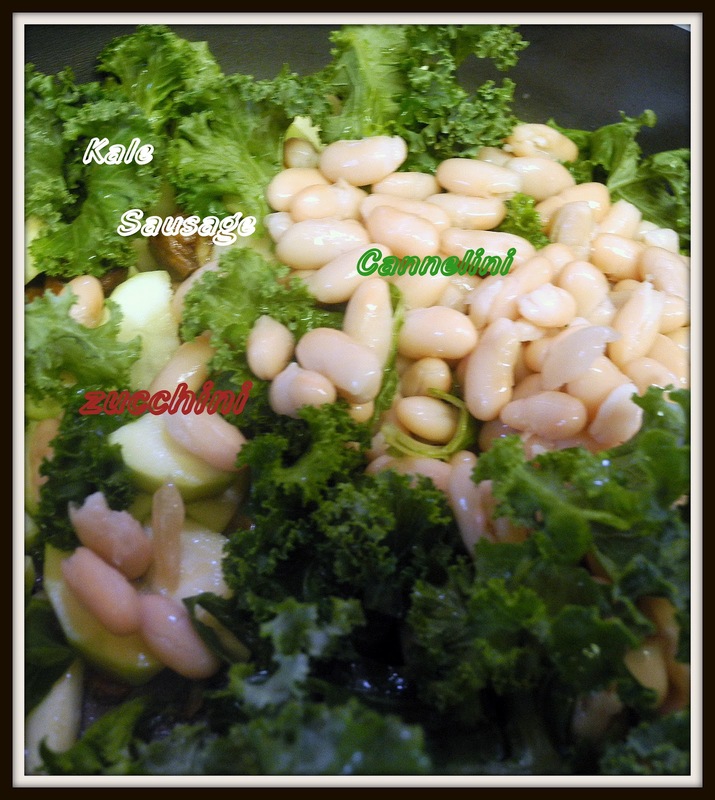 I decided to shorten the "real" title and use the first words, White Bean and Sausage Ragout. 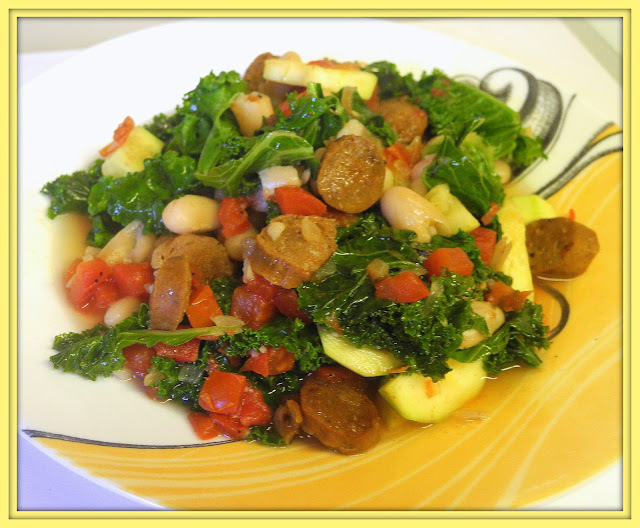 I could have called it, Kale- Tomato Ragout or White Bean and Tomato or Sausage and Zucchini......you get the point. In the end, I guess it does not matter, in this case. What does matter is that this made a successful dinner. Hubby gave compliments, galore and eat his fill. I thought, it was a good combination, sharing good flavor with good textures. 2 chicken sausage, cut into 1/4 inch slices . Sauté onion and sausage 4 minutes or until sausage is browned. Add zucchini and garlic; cook 2 minutes. 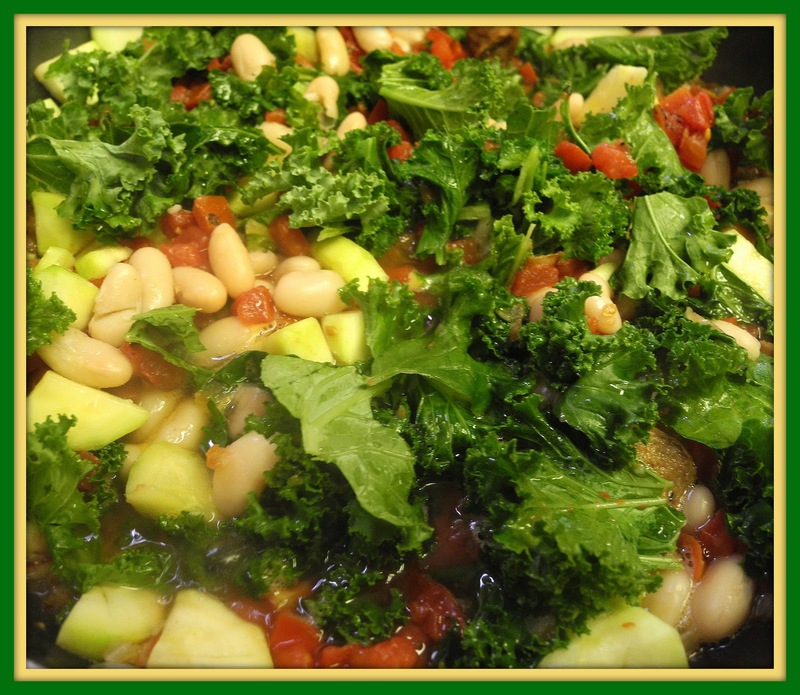 Add kale and remaining ingredients; bring to a boil. Cover, reduce heat, and simmer 10 minutes or until thoroughly heated. Serve immediately. I have not tried cooking chicken sausage with white beans before. This combination looks good and healthy too! This looks awesome! Definitely a fresh new approach for us. I look forward to trying it out. I think I'll be making this sans sausage. Great post! A dish where every ingredient is the star sounds delightful.